Hello, I am Chef Timothy Cipriano, Executive Director of Food Services for New Haven, CT Public Schools; proud father of 3 children; strong supporter of Farm to School programs; Co-chair of Share Our Strength’s Taste of the Nation New Haven, a fundraiser to end childhood hunger and I have a monthly cooking segment on the CT CBS affiliate. In my spare time I am a bit of a foodie and beer connoisseur, and I enjoy spending time outside with my kids visiting our local farms and learning about our local agriculture, after all my moniker is the Local Food Dude (grass fed beef, heirloom tomatoes or maple syrup, there is always a new adventure!). Check out my blog http://www.nhschoolfood.blogspot.com/ or follow me on Twitter @localfooddude. On Friday, April 9, 2010 I was one of only three chefs, the others were Tony Geraci of Baltimore City Schools (L) and Sam Kass of The White House invited to participate in the White House Childhood Obesity Summit on April 9, 2010 in Washington D.C. This summit was a part of Michelle Obama’s “Let’s Move!” campaign to solve the epidemic of childhood obesity within a generation and an opportunity for the President’s Task Force on Childhood Obesity to hear from experts and practitioners about the extent and causes of childhood obesity in this country. Their plan to solve the problem within a generation is due to the President in May. The First Lady gave the opening remarks at the summit, saying that “we all need to do our parts as well, because the fact is, that our kids didn’t do this to themselves.” Administration officials attending included Education Secretary Arne Duncan, Office of Management and Budget Director Peter Orszag, Surgeon General Regina Benjamin, Interior Secretary Ken Salazar, and Deputy Secretary of Agriculture Kathleen Merrigan. After Mrs. Obama made brief welcoming remarks, Domestic Policy Adviser Melody Barnes took over encouraging a ‘walk and talk moment’ and said it was time for “all hands on deck,” as the task force focuses on its report for the President. Then each administration official spoke briefly. There was a brief Q & A with the audience of participants, and then Barnes dismissed them for breakout sessions. 3. Reinvent the meal production and its delivery: kids involved in preparing food, local procurement, schools gardens, etc. Find funding for this. We need to rethink the business of meal production and its delivery with programs such as Farm to School. The schools that have gardens and Farm to School programs are some of the most progressive in the country. We need to educate school nutrition professionals about the myths of USDA regulations: buying LOCAL and having school gardens is not only acceptable but encouraged from USDA. Funding for Farm to School programs is included in Child Nutrition Reauthorization. New Haven is one of many school districts leading the way of offering healthier food options in schools and enhanced education in healthy eating. We have received a number of grants for improving the food in schools including expanding breakfast offerings and modernizing the food preparation equipment in schools. Additionally, we are increasing the amount of fruits and vegetables available to students (some from local farms), we have added roasted chicken on the bone to the menu at all schools and have significantly reduced the amount of breaded proteins by eliminating breaded chicken nuggets, chicken patties and mozzarella sticks. We took a big step a year ago by removing all a-la-carte snacks from K-8 schools (i.e chips, cookies, etc.) and are working to incorporate more vegetarian options into the school lunch menu. Additionally, school gardens are becoming very popular in our schools and we are working on a plan to create a district farm that will educate students and produce ingredients to be used in the district’s meals. I am both honored and excited to be working with The White House and USDA on this important initiative on combating childhood obesity. As a school nutrition professional it is very encouraging to have so much support from the federal government surrounding child nutrition. I would not be able to accomplish all that I do without my dedicated staff of food service workers. The workers have stepped up to the plate to work with me on my team. We now make mashed potatoes utilizing fresh local, red potatoes that come in a 50# bag with DIRT on them and have to be cleaned, cut, steamed and mashed! These workers have rallied around the idea of utilizing actual kitchen equipment (buffalo choppers, knives, robo-coupe & mixers) instead of the more popular kitchen equipment used previously (box cutters and can openers). This is all possible and happening because we are all working as a team! Not just me and my workers but the states, Congress, The White House, USDA, School Nutrition Association, community groups, advocates, students, teachers, administrators and you too Mrs. Q! Your posts have opened up America’s eyes to school meals. This is so awesome! I'm glad the white house appears to be listening. I hope they can realize that we parents are really wanting this and that they do what's best for the children instead of what's best for the bottom line and business. I also hope they see how the current requirements appear at first to make it harder for schools to purchase fresh food and prepare from scratch (based on budgets and how cheap USDA foods is providing the frozen processed stuff) and that they can teach schools how to use the requirements in a more healthy way. You are absolutely right with all the points raised. It's a good starting point and very important that we all get it right. However, I think this approach should be multi dimentional. We should educate our kids about dangers of obesity and benefits of healthy eating. A national legislation is required to impose reduction of fat, chemical and coloring additives, salt and sugar used in processed food and snacks. Most important of all, we should teach our children the value of daily exercise and sport. The modern life and lack of physical exercise is a big contributor to obesity. I would love to know more about where grants can be found to improve school lunch. Our biggest obstacle in working with our school board is definitely finances. Also, how does school garden work in CT? It seems like it would be great in southern states with long growing seasons but here in IL, local wisdom has it you never plant anything before Mother's Day unless you are willing to lose it in a late freeze. By then, we only have a couple weeks of school left. I guess northern states could still get a few cool weather crops harvested in spring/fall but I wonder if it's worth the effort if schools not even in session for the majority of the growing season (or else who would tend the garden?!). Sorry, Mrs. Q, I guess my questions aren't really topical to your blog. Just thinking out loud! Thanks for your post Chef Cipriano! Seriously, if every school had someone like him or Chef Geraci (whom I've read about on Edutopia and am very impressed with) in charge of food, imagine how great that would be. I think having someone with the proper skills and attitude in charge of a district's school food program is so key, and they must have the backing of the administrators and school board. Contrast these two guys with Rhonda the bureaucrat on Jamie Oliver's Food Revolution in Huntington. She means well, but I don't think she really "gets" it. 1. It's cheaper to outsource our food services. 2. It's cheaper to buy processed food. 3. We don't have the money or staff to run a school garden, and what happens during the summer? 4. Our kids won't eat healthy food. 5. We don't want to give up the money we get from vending machines and a la carte sales. Not everyone gets the grants Chef Cipriano got. Is it possible to get those kind of good results with an Aramark-like company? What would it take for Mrs. Q's school to go from where they are now to where the New Haven schools are now? Also (and here's the globally important question), now that Chef Cipriani has the ear of the First Lady, is he going to bring up the US policies on food subsidies which make corn and soy and their products so cheap and prohibits farmers from growing real food? Some believe this is the main reason processed food is cheap, dominates our stores, and allows for calorie-dense but nutrient-poor foods to be the most economical option for many of us to eat. Any Google search for "farm bill subsidy obesity" will net a lot of results. I realize this may not be his area of expertise, but as long as he's in on the conversation with people in charge, why not ask the question? While I myself lean towards a Low Carb lifestyle, I think this is a huge step in the right direction. Low carb is seen as a way to "fix" Metabolic Syndrome which is brought on by the Standard American Diet (obesity is only one symptom). Starting with real nutritional education at a younger age would require far less "fixing" something that should never have been "broken" in the first place. First I would like to say Congratulations to the guest blogger! What an honor!! I homeschool my children, so school lunches are not a part of our day. I am so glad, though, that this problem is being taken seriously and a lot of people are working towards changes. As a diabetic with colitis, high blood pressure and high cholesterol even though I am only about 35 lbs overweight and only 38 years old, I am very concerned with childhood nutrition. I really wonder if in the 80's when I was growing up, we would have known as much about nutrition and whole foods as we do now, I wonder if I would be in the shape I'm in now. I work very hard at making sure my kids eat well. I am really glad to see some schools are taking the lead to make changes. Thank you Chef Timothy Cipriano and Mrs. Q for caring so much about children! Kudos, Chef Tim for what you've accomplished in NHPS. As a former teacher in the NHPS, what you've done for out school system has been fantastic and you were a pleasure to work with. Congrats on being the Blog of Note. You and Mrs. Q are amazing!!! I think what you are doing is amazing. How many students attend your school? A school garden that actually feeds our kids seems like a great idea. Our elementary has almost 1400 students, so it seems like an impossible task. At home, my family has a garden (blackberries, tomatoes, carrots, radishes, all the herbs I use for cooking, strawberries and peas along with 2 peach trees, 2 apple trees and a pear tree)and we compost. I often find myself telling my kids stories about how we were not allowed to snack growing up and, most day, once outside, we remained there until meal time. I have great memories of eating directly from our fruit trees and garden (not to mention drinking from the hose). My kids love being able to pick berries and fruit and eating it immediately. I wish more kids could have that experience. It may be less expensive to outsource food service to another company it all depends on what comes first; money or the health of our children. Corporate food service's #1 goal is to make profit, profit and profit, anyway they can. They need to appease their shareholdres first, not the children. Processed food is less expensive because the quality is sub par. We are not a full cook from scratch school district. We rely on USDA Foods to operate our program. We just choose foods that are less processed and when paired with the right food and sauces taste good. We don't have additional money or staff to run a school garden either, but what we do have are CHAMPIONS in our schools in the form of students, teachers and parents who want to run a school garden. In the summer parents and students volunteer their time to care for the garden and they get to share in the harvest over the summer. It's not impossible to make something like a school garden a reality. Kids are fussy, picky eaters that is for sure. 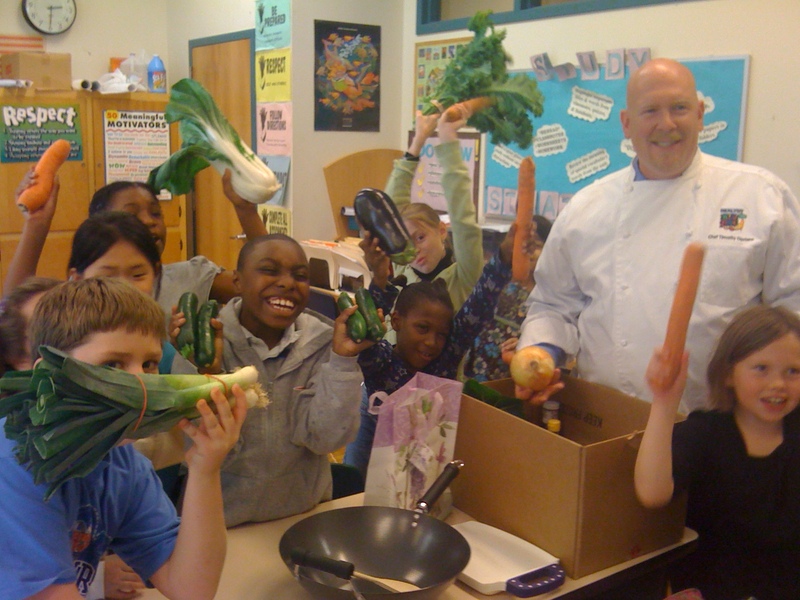 The best way to get children to eat healthy food is encouragement and make it fun. Chef Tony in Baltimore tells this great story about offering "no thank you" bites to his students. The food of the day is put into a small souffle cup as a sample and the children can take a sample (if they take it they must eat it) or say no thank you. Every kid that takes a sample gets a star next to their name. At the end of the month Chef Tony throws a constellation party for all the kids with the stars, it turns into a competition with the kids trying to get the most stars! Kids will eat healthy foods, it just takes time. How much money do you actually make when you factor in labor, fringe, and food costs into the mix? Is it worth the sacrifice to the future health of the students? If you are in a district with many students that qualify for free and reduced meals these children are spending money that their parents can use to buy food for home, or pay bills. I would rather have my children be upset than to let them spend $2 on chips and a sugar laden fruit juice, thats $10 a week and $360 for the school year per child! That is REAL money that can be used at home, especially for the families that qualify for free and reduced priced meals. They need this money, the children do not need the junk food. Children are in school to LEARN, we need to EDUCATE them about eating right, learning where their food comes from and good physical activity. Last point in reference to the "globally important question": For the educational farm that we are hoping to create, we will be growing corn to educate our children about how corn disrupts the soil and how corn is changing the entire food system. This is important to teach our children. I am very interested in how you manage to afford real chicken on the bone. We met with food services in our district last week and they tell us they rely completely upon USDA meat and that they are not able to get unprocessed (at least, unbreaded) chicken, except maybe once a year. They also tell us their number one directive as a department is that they have to be self supporting. I know that New Haven isn't a wealthy district (I think they have a lot in common with Tacoma) how are you managing all this? Nice of Blogger to send us here when such an interesting discussion was taking place! Congratulations on your distinction! I hope the topic of the flavored (i.e. sweetened) milks that are provided with school lunch on a daily basis is being looked at. I know that it's here because someone along the way decided that sugar milk is better than no milk. But really, this is so out of hand, and it has essentially STOPPED my kids from drinking any other milk. I would much prefer that my kids drink water. PLEASE use your powers to address this, if you haven't already!